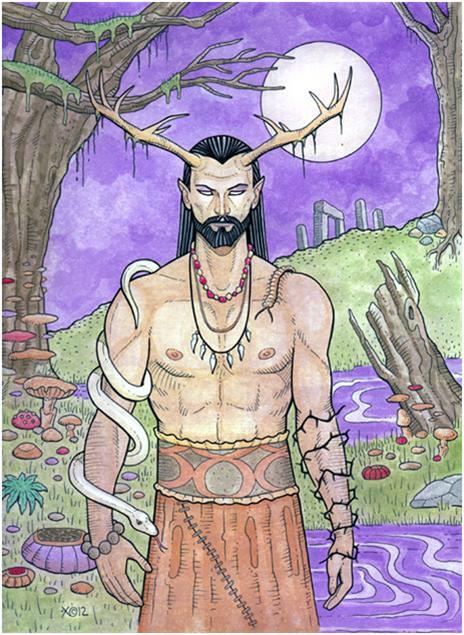 The Horned God is the evocative name a 20th century melding of several ancient images of gods such as Cernunos, Herne the Hunter, Pan, Dionysus, Janus, and Green Man. Not much exists in writing and the oral tradition has been lost, so modern pagans worship the male energy force of winter as the Horned God. 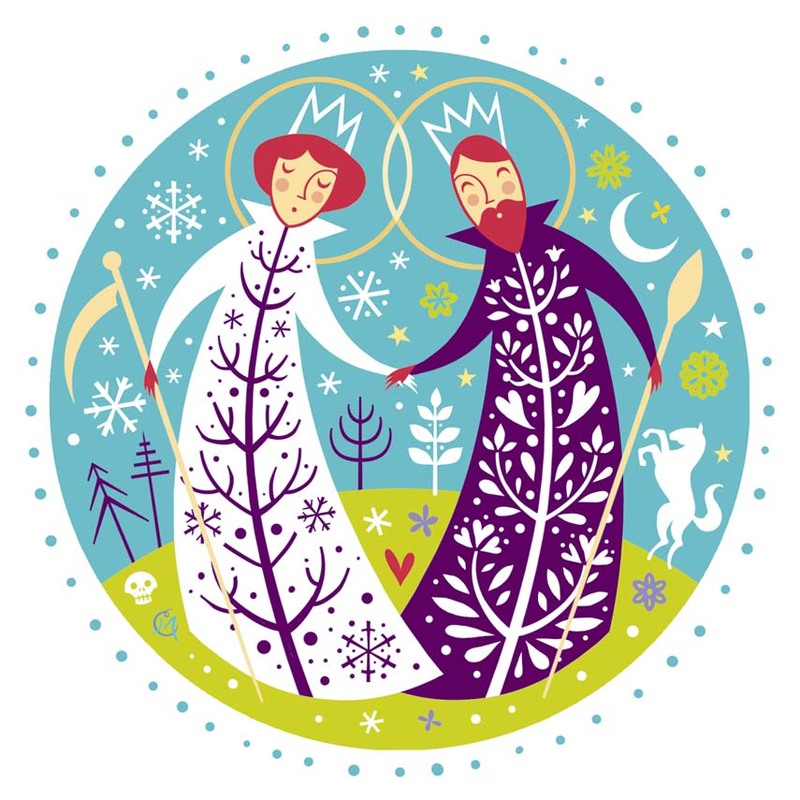 He is the Great Father, the Lord of Winter with sovereignty of the male aspect of creation and fertility. He has the power of creation and destruction. He harvests the land of dead animals and cares for the land in the cold dark of winter.While the Horned God may be a modern derivation of ancient images, the ancient and powerful life (and death) force her represents remains present in our world and in our lives. I who am called Lord of the Wild Hunt, Herne, Cernunnos, Pan, Janus and many other names. 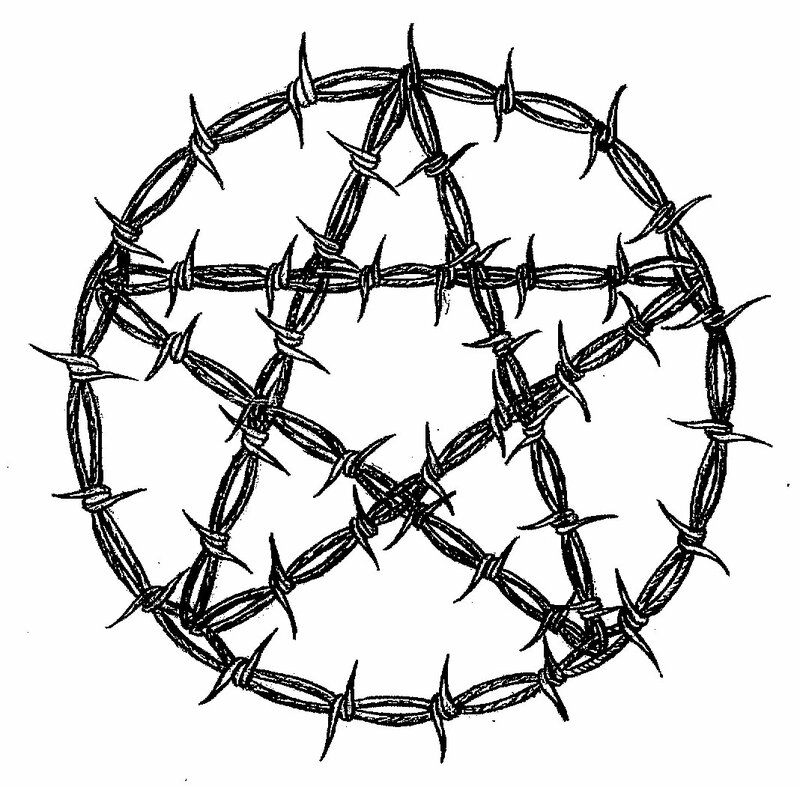 Guiding, harvesting, and knowing you soul. And you will be stronger still in the light and warmth. And live each season according to its turning. With connection, power, and strength. And be understanding of those you do not comprehend. And live in the rhythm and melding of opposing forces. Live the short days and rest peaceful in the long nights. Be one with me and know peace. This was a wonderful book to write and hard to get published. Books on men in the Craft don’t sell, according to the publishers. At least don’t sell fast enough or hard enough for the big publishers to invest in it. It takes small publishers committed to serving the community. Such is Lorna Tedder and her staff at Spilled Candy. Many thanks to them. If you are woman and you wish to find a God who loves you and serves you, He’s here. If you are a man and you wish to find a positive, authentic way to look at the sacred masculine. He’s here. It’s a wild ride and time for the Wild God and the Rowdy Goddess to play. May your journey bring you joy! At work earlier this week, we had a women’s luncheon in honor of Women’s History Month. On the table were rectangles of colored paper with different quotes about women or about living as a woman. This one really struck me because I have always struggled with the concepts of femininity. What do they mean to me, and how can I live up to them? Do I want to live up to them? When I was younger and a Christian, the concept of femininity was harder to deal with because it involved being submissive and obedient, often to people for whom I had little or no respect; it was expected because they were men. The group was organized around the polarities of masculine and feminine–the “guys” were in separate teams from the “gals.” At one point, the guy’s teams let it be known that they’d like the gals to dress more feminine. Since we were in college in the heyday of the jeans and tshirt era, I could only assume that meant dresses and make-up. Actually that was what it was. Clearly, being smart and witty and devoted to Spirit were not particularly feminine ideals! Fast forward many years, and here I am in the pagan and Goddess community where feminine and masculine are considered sacred and mirrored in our lives and the world around us. Everytime anyone described the qualities of the Sacred Feminine, they tended to center on the same sort of characteristics and sometimes echoing the qualities of a Christian “gal,” awakening more doubts for me. Everytime I thought of a characteristic of the Sacred Feminine, I could think of a man who demonstrated these as well or better than any woman I knew. And vice versa for Sacred Masculine. The last thing I wanted to do was have a list of essential qualities for the Sacred Feminine and another opposite list of essential qualities for the Sacred Masculine. Eek. No one can measure up to that kind of essentialism. Not even the Goddess or the God. I read somewhere, and I can’t remember where [darn it] that when we conceptualize the Sacred as Feminine and Masculine and we assign qualities to it, we need to think of those qualities in the broadest and most expansive ways. That to say that the feminine energy is negative and masculine energy is positive is to describe the energetic flow of power and it is in no way analogous to our lives in our societes. In this case, the Sacred Feminine and Masculine are not comparable to the lives we lived situated in place and time. To understand these sacred energies, we must move out or our lives and move into the energetic flow of the Universe. When we do, we gain a new understanding. We learn to reframe our old understanding of how the world works. So the idea that negative is bad no longer makes sense, and we learn that negative and positive are just kinds of energy. Like a battery. Both are needed to power the Universe. That helped me to realize that I was bound by my own experiences of place and time, and to understand who and what the Sacred is, I need to move out of that into the ecstatic Universe. And like so many things, it is so difficult to articulate. It is because we are describing feelings and experiences. The Sacred, both feminine and masculine, must be experienced in our souls as well as in our bodies. We can wrap our minds around it, but we may not be able to describe it in a way that will be understandable to someone else. Even if we can, their experiences may lead them in another dance towards a different understanding. And then we all meld together in the Sacred, dancing in the light and the dark. Ecstatic, rowdy, and joyful! !